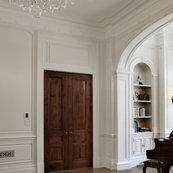 22 Reviews for Traditional Door Design & Millwork Ltd. Comment from Traditional Door Design & Millwork Ltd. Thank you so much Joanna -- I'm glad you're happy with everything. It was great working with you. Thanks so much. It was a pleasure working with you Vince & Nadia. My wife and I can't stop admiring our new custom doors from Traditional Door. Highest quality. Great experience from start to finish. Their quality workmanship surpassed my expectations. They were great to deal with and I have recommended them to many friends already. Very professional company with excellent detail and craftsmanship. Employees are great to work with and do their best to accommodate schedules. Thank you so much for your kind words. It was a pleasure to work with you on this project.